Recently, Tagbilaran City, Bohol Capital hosted an international cruise ship MV Europa 2, a new 42,830 gross ton liner with 282 foreign and Filipino tourists, and over a hundred crew under Captain Wolter Ulf Adolf Paul, on their 14 day Asian cruise. United States Embassy media spokesperson Andrea Echavez, at the city tourism port cruise arrival area told media that the visit is part of the promises that US gave to Bohol as its big brother. 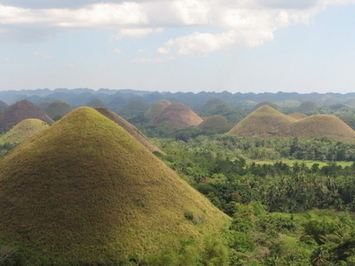 Bohol earlier carved a niche in eco-cultural tourism as it packaged itself as a tourism paradise and banked on its warm people as come-ons for international and domestic tourists. But as the dust brought by the quake settled, much of Bohol’s dream of economic leap turned into a nightmare. After the quake, the US government, through the US agency for International Development (USAID) came to the rescue, especially in tourism rehabilitation. US ambassador to the Philippines Philip Goldberg, in his first visit to Bohol, a few weeks after being appointed, assured US’ support to Bohol. With the Bohol Tourism Council, a strong private sector group, tourism authorities announced Bohol tourism back in major circuits, a few days after the calamity. “We are back”, excitedly declared Bohol Tourism Officer Josephine Cabarrus, at the cruise arrival tent pitched at the port of Tagbilaran, during a rainy day with the cruiser’s tender boats ferrying tourists and crew ashore. Looking at the potential boost of the local economy with the cruise arrival, excursion officer Martina Graf revealed that each of the tourists on board pays about 600 euros per day for the 14 day cruise. A brand new cruiser from Happag Lloyd, MV Europa 2 is a 5 star luxury ship brought in tourists on shore excursions to Bohol’s famous tourism sites including the Chocolate Hills, tarsier, Bee Farm in Panglao, beaches, and Loboc River lunch. Along the way, tourists are expected to grab souvenirs, said Raul Asutria, Sharp Travel president, and organizer of the Bohol tour.